The Pritzker Prize for 2019 has been awarded to Arata Isozaki, the 87-year-old Japanese architect with a career ranging from brutalist libraries to an inflatable purple concert hall. His most famous building is LA’s MOCA, or Museum of Contemporary Art, on Grand Avenue. However, the 1986 structure has never been a huge hit with the public. But MOCA’s new director Klaus Biesenbach sees poetry in the design -- likening the complex to a “sunken pool” -- and promises to restore its “luminosity,” bring greenery to its arid plaza and, maybe, add a reflective water feature in the subterranean entry area. 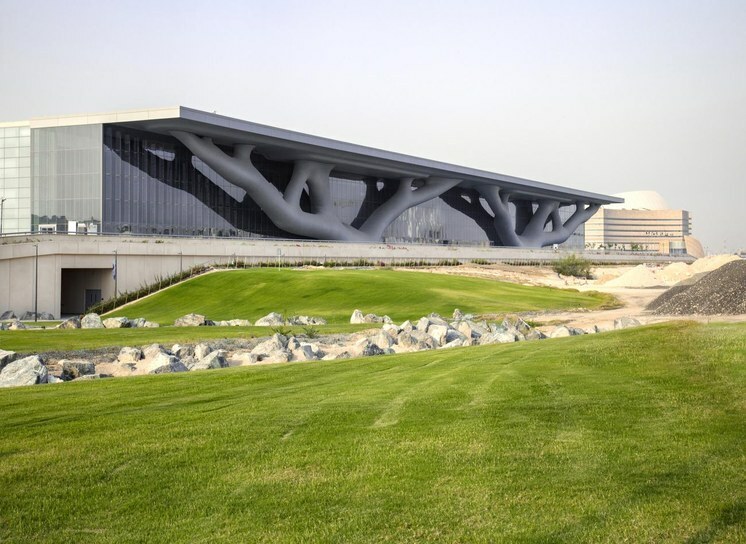 Japanese architect Arata Isozaki has won the Pritzker Prize, the architecture world’s most prestigious award (endowed by the Chicago-based Pritzker family). 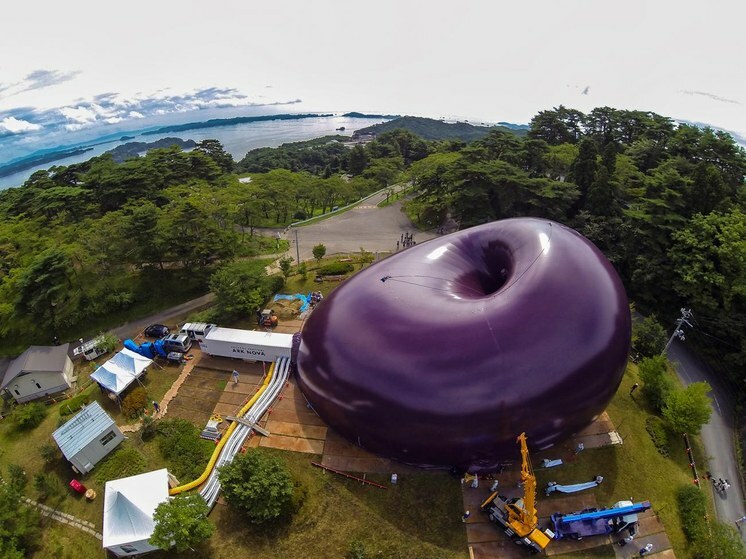 The 87-year-old Isozaki has built a large and varied body of work, ranging from early brutalist houses, libraries and medical centers through to a plum-colored inflatable concert hall, designed with artist Anish Kapoor, to bring cheer to communities devastated by the 2011 Tōhoku earthquake and tsunami. But one of his most famous and much-cited buildings is his 1986 design for MOCA, the Museum of Contemporary Art, on Grand Avenue. 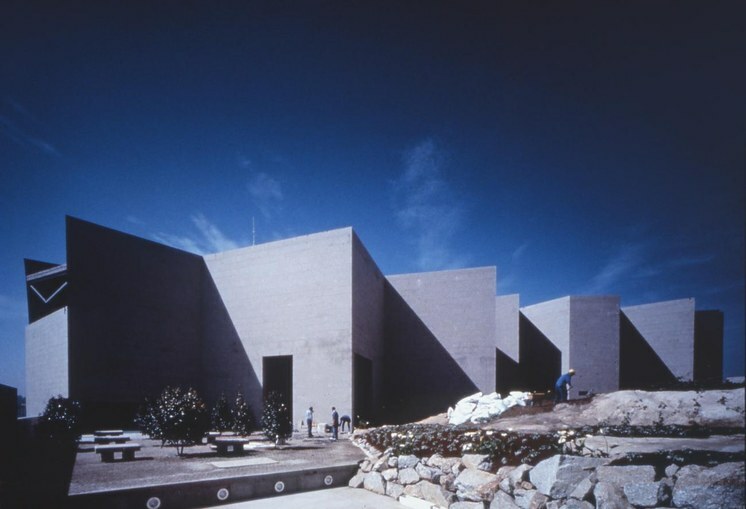 This was his first international commission, won in a 1981 competition, and the almost 100,000 square feet building consists a series of galleries with pyramidal skylights that run underneath a plaza. The museum was a byproduct -- the one-percent for art set aside -- of the development by the California Redevelopment Agency of California Plaza, a cluster of office towers atop Bunker Hill, designed by the late architect Arthur Erickson. Due to demands to not block the view from these towers, the museum was forced to be largely buried underground. It is signaled by a red sandstone half-cylinder barrel vault on pillars. The design is considered Postmodernist, in that it collaged platonic solids like the pyramid and cylinder, cubes and rectangles. “Not since the French architectural visionaries of the 18th century has an architect used solid geometric volumes with such clarity and purity, and never with his sense of playfulness,” wrote architectural critic Joseph Giovannini of the complex at the time. 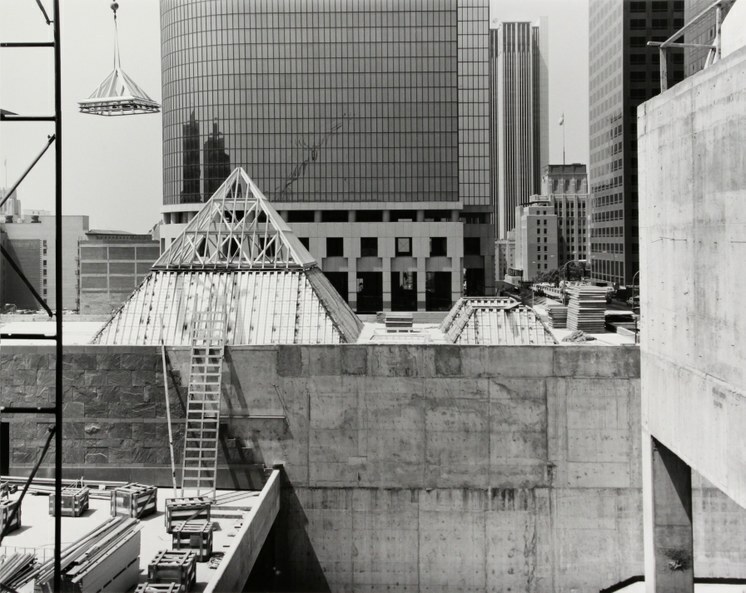 Joe Deal, Large Pyramid, Gallery A and Library, 1986, gelatin silver print, 14 x 17 in. The Museum of Contemporary Art. But, clad in red Indian sandstone, it has a solidity and serenity that separates it from the historicist postmodernist buildings of the period that slathered on decorative neoclassical references for stagey effect. This in-between quality cemented the perception that Isozaki’s work represented a unique convergence of East and West. And this perception was borne out in his presentations. Now while MOCA was lauded on its completion by critics, the building has not aged well. Many visitors don’t find it appealing, with dingy light, an uninviting basement area and a barren plaza. Its site was for several decades an unappealing location, at the top of Bunker Hill with cultural monuments but little street-life, though that is now changing. But the museum’s new director Klaus Biesenbach is a fan, and in fact has plans to honor Isozaki’s original design. MOCA rendering courtesy of Arata Isozaki and Associates. On arrival at his new post Biesenbach walked through the building photographing its geometrical forms: “the pyramids as triangles, a cylinder, the library which of course is a semi circle, every single window, every single detail is a perfect square, the ticket box a perfect square.” He explained to board members that these platonic solids, demonstrated so clearly in the original rendering, above, echoed the minimalism of the museum’s contemporary art collection. 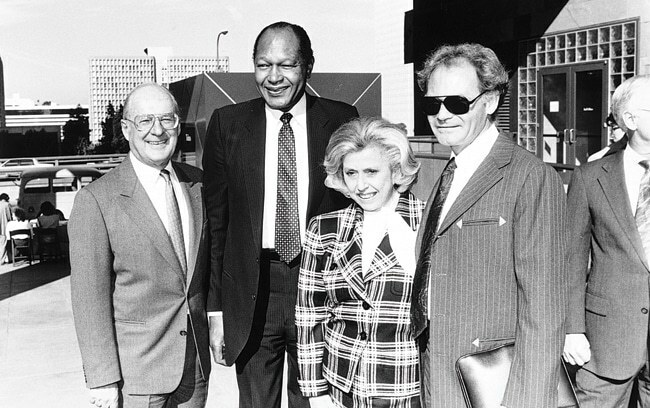 Fred Nicholas, Mayor Tom Bradley, Marcia Weisman and DeWain Valentine at the 1986 MOCA Grand Avenue dedication. Biesenbach blames the dingy quality of the present galleries on the growth of buildings around the museum that have cast dark shadows. 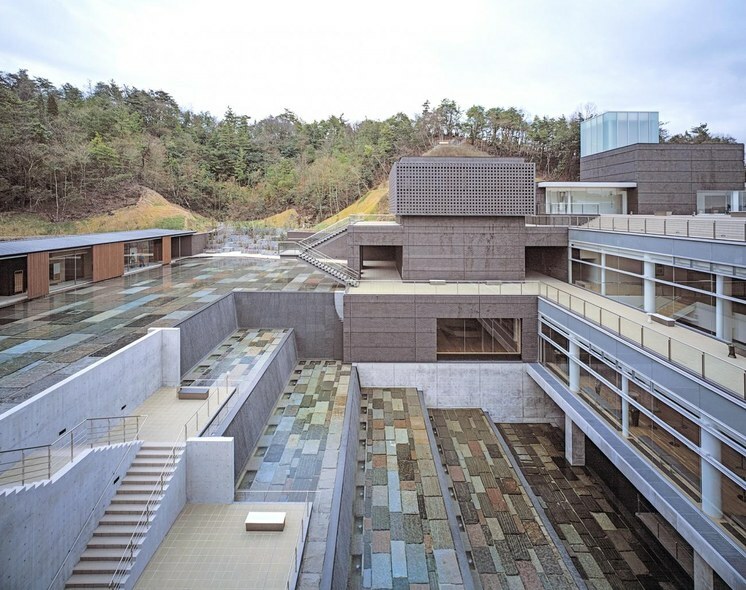 He plans to use filters and computer screen systems to restore the quality of natural light realized by Isozaki on the building’s completion. He also promises to enhance the arid, underused, street-level plaza by greening it, with inviting landscaping and vegetation. And he has a novel idea for the outside basement area at the bottom of the steps leading into the museum: to translate his “sunken pool” metaphor into something more literal. Does this mean adding water?, asked DnA. At this Biesenbach did not say no, asking, had we talked to the artists already? No, we hadn’t, but water seemed like the logical extension of the metaphor. So while he did not say exactly what he has in mind, expect the new MOCA to have some kind of actual sunken, reflective pool or water feature. 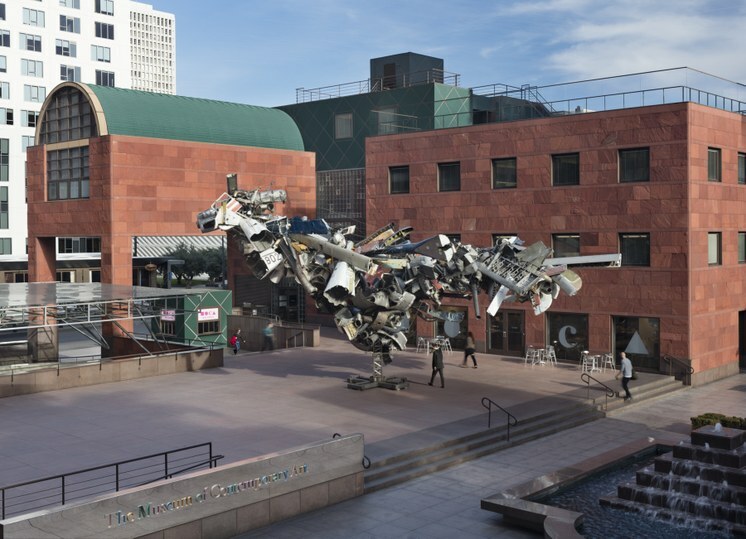 When MOCA opened in 1986 it was celebrated with five nights of parties. “People were so hungry for this,” Merry Norris recalled, in reference to a community of collectors, artists, planners and elected officials that included Tony Berlant, Ed Moses, Robert Irwin, Eli Broad, Max Palevsky, Marcia Weisman, Dewain Valentine, Andrea Van de Kamp and Mayor Tom Bradley. But ironically the building wound up being upstaged by the 1983 Temporary Contemporary, now known as the Geffen Contemporary, in Little Tokyo. 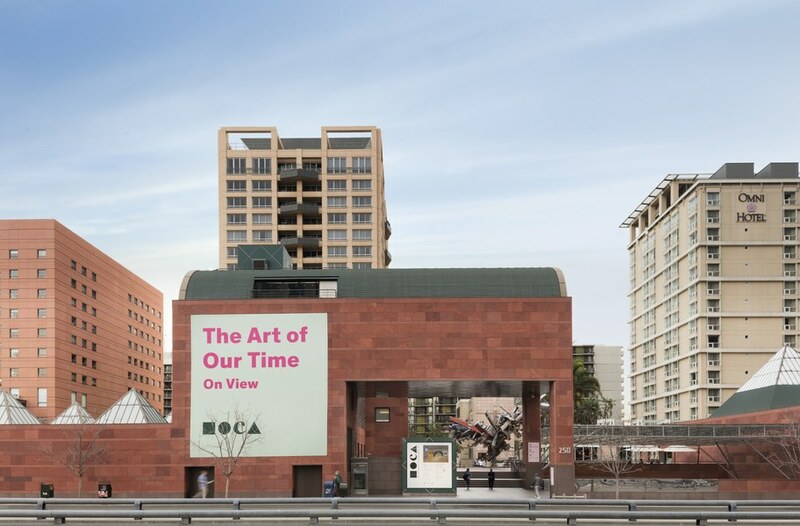 The conversion of a police car warehouse designed by Frank Gehry was meant to be a short-term artspace while the MOCA team fundraised to build the permanent structure by Isozaki. But the Temporary Contemporary met with such delight that it became a permanent branch of MOCA and arguably came to exceed in popularity the Grand Avenue building. DnA asked Biesenbach if he felt an obligation to restore the status of the Grand Avenue building. In response, he referred to his experience as chief curator-at-large at the Museum of Modern Art and director of MoMA PS1. MoMA PS1, he explained, is very much a “Geffen-like Kunsthalle that you can change completely and have large expensive shows” while MOMA is closer in analogy to MOCA. As for the selection of Isozaki for this year’s Pritzker award. Well, Biesenbach was delighted and proved prescient.